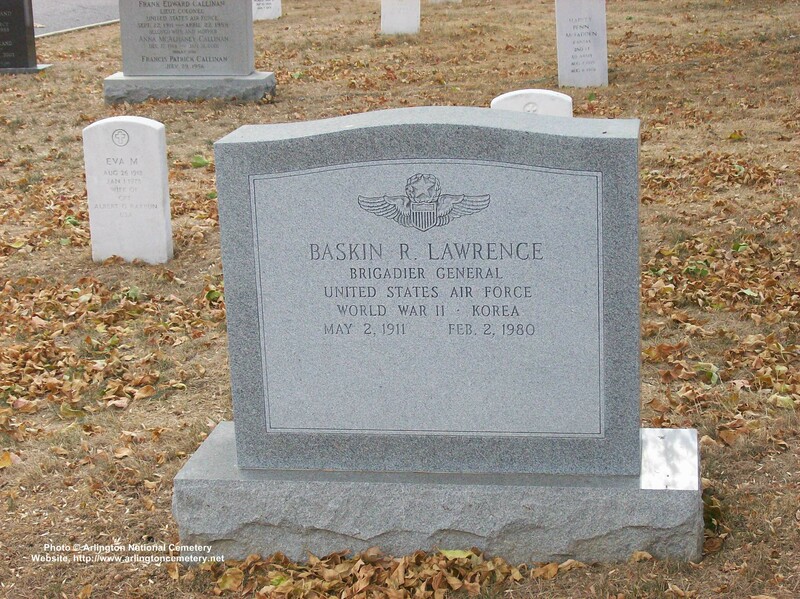 BRIGADIER GENERAL BASKIN R. LAWRENCE JR. Retired February 15, 1964. Died February 2, 1980. Baskin Reid Lawrence Jr., was born in 1911 in Seneca, South Carolina. He graduated from Seneca High School in 1928, and Clemson A&M College in 1932, receiving a bachelor's degree in Electrical Engineering and a Second Lieutenant commission in the Infantry Reserve. He entered the Army Air Corps Flying School in March 1934 where he successfully completed pilot training as a fighter pilot. His first assignment after Kelly Field was the 1st Pursuit Group at Selfridge Field, Michigan. In 1938 he was transferred to one of the Air Corps' first heavy reconnaissance squadrons at Langley Field, Virginia, which later moved to Miami, Florida. This squadron was later converted to a heavy bomb squadron assigned to the 91st Bomb Group which was sent to the 8th Air Force in England in September 1942. Colonel Lawrence later commanded this group, and completed 11 combat missions and 59 combat hours. In late 1943 Colonel Lawrence was given the task of activating the first "Pathfinder Group," the 482nd, which was equipped with the first radar bomb system in the Air Corps, called the H2X. He received twelve H2X-equipped B-17s with specially trained crews who had no combat experience. When Colonel Lawrence requested time to combat-train these crews, the commander of the 8th Bomber Command answered, "You will train your crews over Germany, and the 8th Air Force will follow you dropping bombs when you do." For his performance in the 8th Air Force, he was awarded the Silver Star, Air Medal, and numerous citations including the Presidential Unit Citation. At the end of World War II, Colonel Lawrence entered the Air Force Institute of Technology completing a two-year course in aeronautical engineering (electronics). He was then assigned to the Engineering Division, Air Materiel Command, as chief of the Materiels Laboratory, and later as deputy chief of plans and operations, Wright Air Development Center, Ohio. 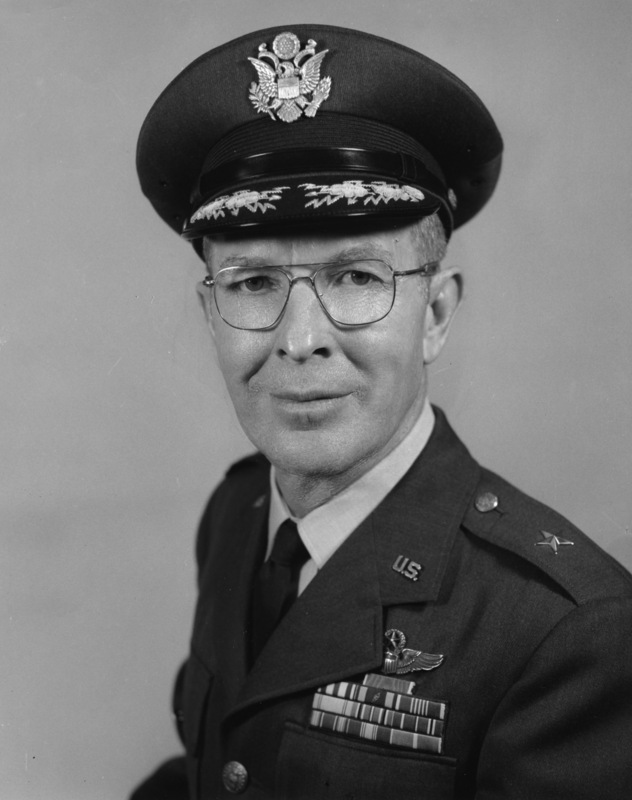 He attended the Air War College in 1952-53, from which he was assigned to the Far East Air Forces as assistant deputy chief of staff, intelligence. During his Far East tour, Colonel Lawrence was appointed to head a Joint Department of Defense/Department of State investigation into the interception of a U.S. Air Force RB-29 by a Russian MIG aircraft on Nov. 7, 1954. His report of this incident was accepted as the U.S. position in an extremely delicate international situation involving the governments of the United States, Japan and Russia. For this and his manner of performance at Far East Air Forces, he was awarded the Legion of Merit. In January 1956 he returned to the United States and was assigned as deputy director, research and development, Headquarters U.S. Air Force, and in May 1960 became director of technology of the Air Force Command and Control Development Division at L.G. Hanscom Field, Bedford, Mass. General Lawrence remained as director of technology in the newly organized Electronic Systems Division of the Air Force Systems Command. He was promoted to the rank of brigadier general March 7, 1961. On July 28, 1961, he assumed command of the U.S. Logistics Group, U.S. Air Forces in Europe, Ankara, Turkey. Returning from overseas, General Lawrence was assigned duty as chief of the Air Defense Command's Command Control Defense Systems Office at L.G. Hanscom Field, Bedford, Massachusetts, August 16, 1963. In this capacity, he is responsible to the commander, ADC, through the chief of staff, for providing approved ADC guidance, advice and recommendations to the Electronic Systems Division and those military and civilian agencies under ESD supervision, and to keep the Commander, ADC, informed of all significant developments or studies on command and control systems with a possible aerospace defense application.